The class war degenerates into foul-mouthed tirades and stomach-churning violence in Laura Wade’s robust adaptation of Posh, her own coruscating stage play. Posh originated at the Royal Court Theatre in London in 2010 and was revived two years later in the west end, painting a vivid portrait of a fictional dining clique akin to the Bullingdon Club at Oxford University, which once included David Cameron, George Osborne and Boris Johnson in its notorious ranks. Lone Scherfig’s film, retitled The Riot Club, packs a similar emotional wallop to its stage-bound predecessor, detonating pent-up testosterone and tempers with horrifying repercussions. Wade has fleshed out key protagonists and excised some scenes entirely to reduce the running time by 40 minutes. The Riot Club is not a party most of us would wish to attend. But that’s the point. Alistair Ryle (Sam Claflin) arrives at Oxford, hoping to emulate his older brother, a former president of the titular fraternity. This hush-hush 10-strong dining club honours the memory of its libidinous 18th-century founder by boozing to excess at an annual dinner, trashing the venue and paying for the damages out of their trust funds. Given his lineage, Alistair is almost certain to catch the eye of Riot Club president James Leighton-Masters (Freddie Fox). However, it is dashing classmate Miles Richards (Max Irons), from more humble stock, who steals Alistair’s thunder and arouses the homosexual yearnings of influential club member Hugo Fraser-Tyrwhitt (Sam Reid). Alistair and Miles pass initiation and are inducted into the ranks alongside Harry Villiers (Douglas Booth), Guy Bellingfield (Matthew Beard), Toby Maitland (Olly Alexander), Dimitri Mitropoulos (Ben Schnetzer) and George Balfour (Jack Farthing). The students head to a country pub run by Chris (Gordon Brown) and his daughter Rachel (Jessica Brown Findlay), who have no idea of the devastation about to be wrought. 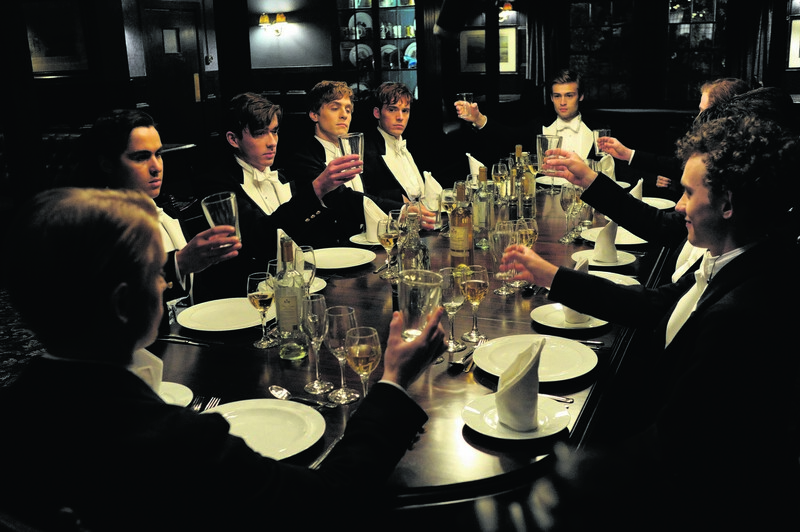 The Riot Club is a sobering attack on a culture of inherited privilege and power in Britain. The Danish filmmaker, who previously helmed the Oscar-nominated coming-of-age story An Education, doesn’t spare the morally repugnant characters any blushes. A climactic showdown is just as jaw-dropping in lurid cinematic close-up as it was from the safe distance of the theatre’s upper circle. There is a soupçon of magic and moonlight, but considerably more insecurities and bluster, in Woody Allen’s playful yet lightweight romantic comedy set on the sun-kissed 1920s French Riviera. The writer-director’s frequent forays away from his beloved New York to European soil have been decidedly hit-and-miss affairs and Magic in the Moonlight disappoints more than it delights. Allen affectionately evokes the era from the opening croon of the Cole Porter classic You Do Something To Me, performed by Leo Reisman and his Orchestra, and the writer-director loads the soundtrack with upbeat jazzy tunes that telegraph the characters’ emotions, like You Call It Madness (But I Call it Love), by Smith Ballew and his Piping Rock Orchestra, to underscore a blossoming central romance. Regrettably, sparkling one-liners are in short supply on the Côte d’Azur and the onscreen chemistry between Colin Firth and Emma Stone is lukewarm, never threatening to set our pulses racing like her smouldering pairings with Ryan Gosling in Crazy, Stupid, Love or real-life beau Andrew Garfield in The Amazing Spider-Man. The film opens in 1928 Berlin, where magician Stanley Crawford (Firth) delights a sellout audience in his guise as Chinese conjuror Wei Ling Soo. Backstage, he berates his crew for their incompetence and lives up to the description of his best and perhaps only friend Howard Burkan (Simon McBurney) as “a genius with all the charm of a typhus epidemic”. Howard entreats Stanley to accompany him to the Riviera to debunk a psychic medium called Sophie Baker (Emma Stone), who has promised to help wealthy widow Grace Catledge (Jacki Weaver) make contact with her late husband. In return, Grace has pledged to fund an expensive institute fronted by Sophie’s mother (Marcia Gay Harden). Swatting aside warnings about Sophie’s beauty – “A pretty face never hurt a cheap swindler,” retorts Stanley dryly – the magician bids fond farewell to his fiancée (Catherine McCormack) and heads for the Catledge villa posing as businessman Stanley Taplinger. In no time at all, Stanley is almost as smitten with Sophie as Grace’s lovesick son Brice (Hamish Linklater) and the celebrated magician struggles to find a rational explanation for her boggling feats of mindreading and clairvoyance. Magic in the Moonlight is a valentine to Allen’s lifelong fascination with tricks and illusions, and he engineers one moment of misdirection to quickly untangle the knotty central plot. An even bigger trick would be convincing us that Firth and Stone make a perfect match, but it’s doubtful Houdini could have pulled off that gross deception. Supporting cast, who have a canny knack of scoring Oscar nominations in Allen’s work, are subdued, even Eileen Atkins in the plum role of Firth’s straight-talking aunt, who can sniff romance on her nephew like cheap cologne.